If you have a planted aquarium, it is vital that you provide adequate lighting so that your plants flourish. Planted aquarium lighting is part aesthetic and part necessity, especially if you have live plants in your set up. Plants just cannot live without a light source. LED lights (light emitting diode) have taken over the aquarium lighting business in the past ten years or so. There are excellent reasons why these lights are now so popular. They are accessible, inexpensive, and last for far longer periods of time then their previous halogen or incandescent counterparts. 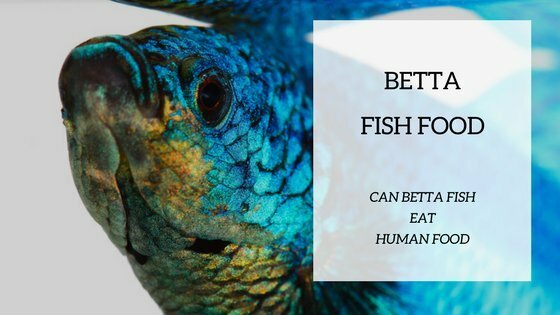 Read this article for a detailed explanation of the benefits of LED lighting for your aquarium. 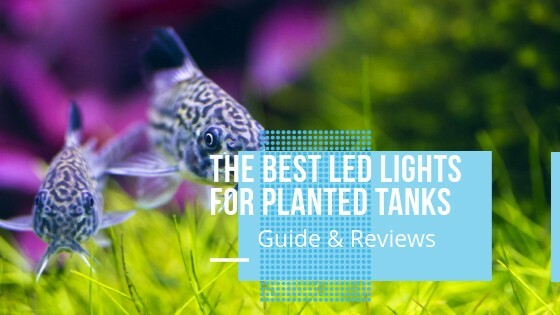 Let’s take a look at the top LED lights for planted tanks that are out there today. We’ll go through why they are the best aquarium plants lights and for what types of set ups they are appropriate for. All plants grow through photosynthesis, even aquatic plants. Plants, and most other living organisms on this planet, grow and flourish with a combination of processes, but most of them need the method of photosynthesis to stay alive. Photosynthesis provides nutrients through the absorption of light to deliver essential energy to the organism. that is installed by the aquarist. There are several planted aquarium LED lighting systems offered to the hobbyist. Choosing the right one for your set-up is crucial especially if you have (or plan to have) live plants in your aquarium. LED lights for aquarium plants are one of the biggest decisions, along with aquarium size and choice of filter system. 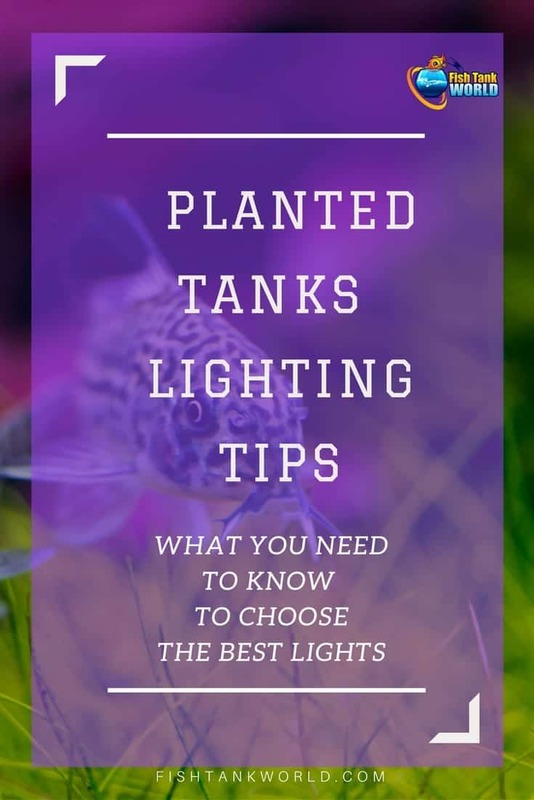 When choosing the light you need to take into consideration the amount of gallons your aquarium will have and the set up you plan on achieving. When purchasing your light system, keep in mind if you want to have live plants or not. This is a personal decision and it will affect other decisions in regards to the accessories that you will need. Here’s an article with a more in-depth explanation of photosynthesis in aquatic plants. There are different types of LED lights. Let’s look at the options that are out there today, so that you can analyse what your needs are and which system will be best for you. Take a look at this chart explaining very efficiently the different blue/red/white light combos and their effects on fish and planted aquatic plants. Often LED lights are sold with pre-set combinations that mimic daylight, moonlight and sometimes even weather patterns like storms and lightning. Measuring light units through PAR (photosynthetically active radiation) is the best way for planted aquariums. Here is an article explaining PAR and how it affects the plants in your aquarium. Of course the size of your aquarium will determine your needs in regards to your lighting. 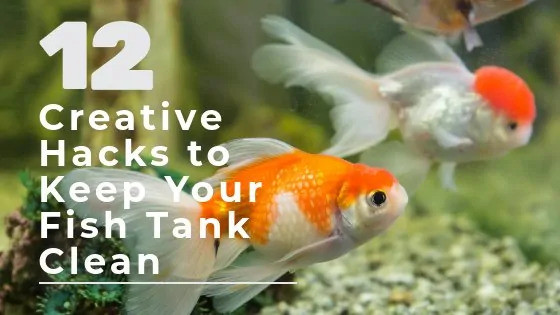 Larger tanks will obviously have more plants and the square shaped aquariums will automatically put the plants in a position that they will be farther away from the light source. You have to look carefully at the light features that explain the light intensity. Sometimes a larger or deeper aquarium may require 2 units. Different types of plants require different intensities of light. When researching your plant choices, keep in mind that they will affect directly the type of lighting that you will need. Some LED lights now provide interesting varieties and combinations of settings delivering essential light to all the plants in the tank. Here is a useful chart with many types of aquarium plants and their individual needs in lighting. LED light prices have considerably dropped in recent years and are now very affordable. The features of the system are what will mostly affect the prices. Does it have a self timer? A remote control? Is it made of plastic or aluminium? A remote control is always a nice feature to have in order to control your lights from anywhere in the room. A self-timer is an option that is also a feature to look for as it will allow you to set the start and shut off of the unit even when you are not there. A must if you are forgetful. Another feature that comes with some models that have the self timers is the gradual light change over time. Some are set at 15 minutes, others at 30 minutes. Lighting pre-sets are an interesting addition as this gives you more lighting options. Extendable brackets are a must if you want the lighting fixture to fit your aquarium properly. Most models are adjustable with extendable brackets. Water proofing is not a common feature, but a necessity if you want to place your lights close to the water and if you think that there will be any chance for splashing. The advantages of installing a LED lighting system in your tank greatly outweighs the older options that we had in the past. LED lighting systems are very effective in providing efficient light, they are inexpensive and last much longer then incandescent and halogen lights. Compared to the older bulbs from the past that used to produce heat, good, functioning LED lights never heat up. If you still have the old style lamps in your aquarium and are due for changing them, it is very wise to go the LED way. The COODIA aquarium light is a hood lighting system with a color changer remote control and dimmable RGBW LED light. 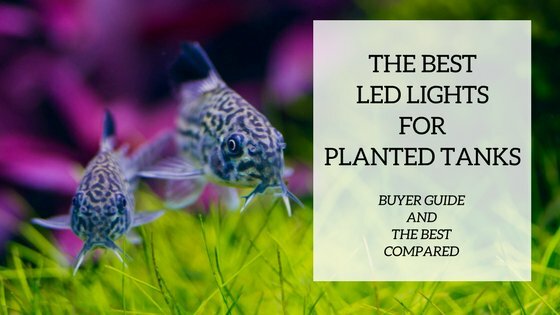 It has several different lighting modes which makes it a great LED light for plants. It is made of high quality materials and is extendable up to 28”. You can use this hood light on aquariums from 19” to 28”. It has an estimated life of 1000 hours. The remote has recently been updated and you can now change the settings from farther away instead of pointing it straight at the unit as it was before. The COODIA LED light is made for freshwater and also for saltwater tanks. This is a good light with great features, all for an excellent price. Would recommend for plants that require low to medium light. The Yescom multi-color 156 LED aquarium light lamp is made for freshwater tanks that are between 45″ and 50″. It is made of durable and quality black aluminium and has the extendable option to accommodate different size tanks. It offers interesting full spectrum, 5 colors, LED with a few modes. It is not recommended for high light plants or if you have a deep aquarium. The Aqueon Optibright Plus LED Lighting System has a sleek, attractive design and will accommodate aquariums that are between 30” and 36”. This being said, like others in this category, it has an extendable element making it adjustable for several sizes of tanks. It is made for freshwater aquariums that have low-medium light plants and for non-plants saltwater tanks. This model comes with a remote control and a 24-hour timer. It has an interesting 30-minute gradient time when changing lighting modes. The Fluval A3997 AquaSky (RGB+W) LED is a sleek lighting system that has the interesting feature of being water proof. It can be mounted closer to the water then other models in this category. This model can be used in freshwater aquariums with low to medium light plants and in fish-only saltwater tanks. This lighting system comes with a remote control and has many different sky presets like sunrise, sunset, lightening, storm, moon, cloud cover and more. The remote has been known to be slightly complicated to use and the on/off completely relies on this remote. This is still in the inexpensive bracket even with it’s extra lighting features. 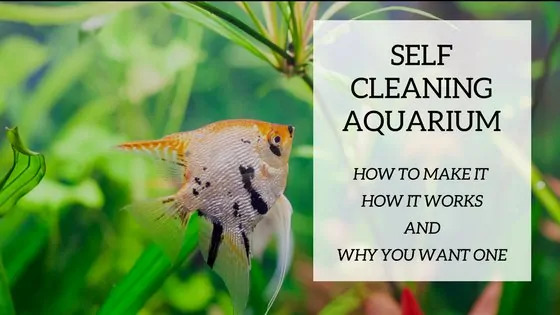 Check out this video showing the features and explaining the functioning of the Fluval AquaSky. The Fluval A3990 Aqua Fresh & Plant 2.0 LED is in the higher price range, but also offers superior lighting. This system can be used in aquariums with high light plants with no worries. The unit can rest above the tanks without the need of a canopy. It is also extendable to fot aquariums up from 24” to 34”. This Fluval LED lighting system is not intended for saltwater tanks. It also features 5 unique band wave modes of light-spectrums. Like other Fluval models, this one is also somewhat water proof and can take some splashing. Watch this video that explains this LED lighting system. The Beamswork EA Timer FSPEC LED aquarium light is a no frills LED with 2 settings. It comes ready to fix a timer, but timer is not sold with the unit. It is made of aluminium and painted black. It has the extendable brackets as others in this category so you can adjust it to your aquarium length. It is one of the most inexpensive LED lights on the market. The light settings are basic white (day) and blue (night). It is recommended for low light plants in freshwater tanks only. Here’s a video of a customer explaining why he chose the Beamswork EA Timer FSPEC LED Aquarium Light for his tank over others in the same category. The Current USA Satellite Plus PRO LED light is on the more expensive side, but boasts more options. It is made of aluminium in a black finish for aquariums between 18” and 24”. It has the common extendable brackets that lets you adjust the light to your exact tank length. This model comes with pre-set lighting settings. It has the basic settings like daylight and moonlight, but also storm and other weather effects. This unit comes with a 24 hour timer cycle and a remote control. The timer has a gradual start up and shut down feature. At the start and end of a cycle, the lights will gradually change over a 15-minute period. Take a look at an unboxing and setting up of the Current USA Satellite Plus PRO LED Light. The Finnex Ray2 Aquarium LED Daylight is made of a unique silver finish, not like the regular black coated ones. The models don’t come with extendable brackets, so be aware. It comes in 6 sizes from 12 inches to 4 feet, so one is sure to fit your aquarium. The Finnex Ray2 Aquarium LED Daylight offers the “true red” which is said is the best light for photosynthesis. The light is known for its brightness and is a great option for low to medium light plants. The unit does not come with a built-in timer nor a remote control. Your bucks go to the quality of the lights on this one. Check out this video from a satisfied customer reviewing his Finnex Ray2 Aquarium LED Daylight. Any one of these models that we have reviewed in this article is a good option for your planted aquarium. Depending on your needs and your budget, there is sure to be one to suit your set-up. Make sure to know what light requirements your plants have to provide the most efficient environment for them to flourish. All that being said, if you have low to medium light plants in your tank, we feel that the Coodia RGBW LED Light is the best one in our review. We chose this one because it has a lot of features for the price without compromising any quality. It doesn’t include a timer, but a wall unit timer can easily be set up on this lighting system. It’s the best bang for your buck in our opinion. Remember, plants need light to stay happy.